During these years, Archbishop Mannix continued as Bishop for the Defence Forces of Australia with jurisdiction and faculties being, at regular intervals, renewed by application to Rome. His appointment as Army Chaplain-General continued until his death in November, 1963. He was assisted by a Deputy Chaplain-General (Army) Senior Catholic Chaplain (Navy) and Principal Catholic Chaplain (Air Force). During these years Chaplaincy services were required not only in Australia, but also with Occupation Forces in Japan and commitments in Korea, Malaysia and Singapore, These years also saw the formation of a Senior Chaplains’ Committee Navy with Father Kevin Ellis as the Catholic representative. Early in 1959, the Department of Defence had began a movement from Melbourne to Canberra, the Capital City of Australia. During the early 60’s, this movement was completed and the Headquarters of the Navy, Army and Air Force were established in Canberra. Consequently, upon the death of Archbishop Mannix in 1963, the Conference of Catholic Bishops of Australia, after consultation with the Catholic Chaplains of the Navy, Army and Air Force, decided that Canberra should become the base for the direction of Catholic Chaplaincy within the Defence Forces. Early in 1964, the Conference of Bishops nominated The Most Rev. Thomas McCabe, Bishop of Wollongong in the State of New South Wales, to be Bishop for the Defence Forces. Following the nomination, Bishop McCabe was appointed by Rome ‘Director’ of Chaplaincy for the Defence Forces of Australia with jurisdiction and faculties. 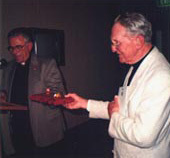 Bishop McCabe established a Secretariat in Canberra with Rev.Fr. John Aloysius Morgan – recently appointed Army Chaplain-General (Roman Catholic) in succussion to Archbishop Mannix as Secretary and Vicar Delegate, Bishop McCabe confirmed the appointment of Rev.Fr.Grantley Lake, Senior Catholic Chaplain (Navy) and nominated Rev.Fr.Bernard O’Regan for the appointment as Principal Catholic Chaplain Air Force as successor to Monsignor Kenneth Morrison. These administrative arrangements continued during the beginnings of compulsory National Service – a period of two years for many young Australians – and for the early years of the Vietnam war. These three priests were made Prelates of Honour of His Holiness in 1967. Establishment of the Military Vicariate of Australia. Following representations made to Rome through the Apostolic Delegate Most Rev.Dominic Enrici by Bishop McCabe on behalf of the Conference of the Catholic Bishops of Australia, the Military Vicariate was established by the Apostolic Constitution “Summi Pastoris” of 6 March, 1969. The Most Rev. John Aloysius Morgan, following his appointment as Auxiliary Bishop of Canberra and Goulburn, was appointed the first ‘Episcopus Castrensis’ of Australia on 29 May, 1969. Bishop Morgan continued to hold the Army appointment of Chaplain-General (Roman Catholic). Monsignor Grantley Lake, Senior Catholic Chaplain, Navy and Monsignor Bernard O’Regan, Principal Catholic Chaplain, Air Force, were appointed Vicars General. Together with three Chaplains – one each from Navy, Army and Air Force – the Vicars General formed a board of consulters for Bishop. The Apostolic Constitution “Summi Pastoris” was published in the Acta Apostolicae Sedis of 30 December, 1969. Among the directives of the document concerning the extent of the jurisdiction, faculties and responsibilities of the Military Vicar was a directive that the Chancery of the Military Vicariate of Australia was to be established in Canberra. During these years that followed the establishment of the Military Vicariate, there developed a greater union among the Chaplains from the three Services (Navy, Army, Air Force), with the consequent advantage of being able to learn from the experiences of each other. From the early 1960’s, all Catholic Chaplains on full-time service have come together for Annual Spiritual Exercises, held at a Diocesan Seminary. Many part-time Chaplains often attend these Spiritual Exercises. The encouragement and assistance of the Defence Force authorities made it possible for maximum numbers to attend, even from distant parts of Australia. Also, during these years Chaplaincy coverage had to be organised for the recently established Defence Force of Papua-New Guinea. These indigenous Servicemen numbered nearly 50% Catholic and were being prepared for Independence. Overseas commitments continued in Vietnam, Malaysia and Singapore, and compulsory National Service. An important development in organisation also occurred at this time when the members of the Chaplains-General Conference (Army) became, as civilians, the official Heads of Churches Committee Navy (HCC). This foreshadowed a total re-organisation of Chaplaincy across the three Services. During 1975 Bishop Morgan, together with three Chaplains and fifteen Servicemen and Servicewomen, responded to the call of Pope Paul VI requesting delegations from all Military Vicariates to join him in Rome for the Holy Year Pilgrimage of Reconciliation. The culminating function of this pilgrimage was the Solemn Mass on the Feast of Christ the King in front of St. Peter’s Basilica. The Holy Father co celebrated the Mass with the Military Bishops for the intention ‘Reconciliation between Nations”. Members of the Australian Military Vicariate had travelled the greatest distance to respond to the Pope’s call. At the time of the Pilgrimage, Archbishop Schirano, Military Vicar of Italy, arranged an informal meeting of the Military Bishops. At this gathering, it was suggested that a more formal meeting should be arranged under the authority and guidance of the Congregation of Bishops. In 1980, the First International Meeting of Military Bishops took place a St. Peter’s Convention Centre in Rome sponsored by the Congregation of Bishops. The Military Vicariate of Australia was represented by Bishop Morgan. It was an historic gathering. From its deliberations and suggestions there developed initiatives that were to lead to the Second International Meeting of Military Bishops in April 1984. Re-organisation of Chaplaincy Administration in the Australian Defence Force. During the twenty years prior to 1980, there had evolved gradually a greater unity between the Navy, Army and Air Force. Originally the three Services were independent, e.g., at one stage, each Service had its own Government minister. By 1981 there had been established a united force with Headquarters Australian Defence Force, having command and direction of its components – Navy, Army, Air Force. It was important that the Catholic Bishop of the Defence Force, together with the Anglican Bishop for the Defence Force and the representatives of other religious denominations, should be linked with the supreme Headquarters. Direction of Chaplaincy throughout the Defence Forces of Australia, during World War II and in the years that followed, was based upon a committee system. During 1980, the Conference of Army Chaplains General (a committee of six members) arranged a conference with the Chiefs of Personnel of the Navy, Army and Air Force, and later with the Commander-in-Chief of Headquarters Australian Defence Force and his staff. The result of these negotiations was that from 1 July, 1981, the following arrangements were established for the control and direction of Chaplaincy in the Australian Defence Force. (1) A Religious Advisory Committee to the Services (RACS) would be an integral part of the Headquarters Australian Defence Force. This Committee would consist of six members – the Anglican Bishop for the Defence Force, the Catholic Bishop for the Defence Force, three members representing Protestant denominations, and a Rabbi representing the Executive Council of Australian Jewry. Present at meetings to assist this Committee would be three Principal Chaplains to represent the Navy, Army and Air Force, and to report on Chaplaincy activities and needs. (iv) Monitor the return of Chaplains to the civilian community in accordance with Service and denominational requirements. (3) Members of the RACS are nominated by the head or governing body in Australia of the appropriate church or denominational group and are appointed by the Minister for Defence. The RACS members have (non-uniform) two star status and meet at Headquarters Australian Defence Force at least four times each year. (4) Within each of the three Services Navy, Army and Air Force, there is a Committee of three Principal Chaplains – Anglican, Catholic and Protestant Denominations. Principal Chaplains have a commission within their Service of one star status. Each committee has the responsibility to provide for the administrative and technical control of Chaplains within the respective Service. (b) that there be established as part of the Congregation of Bishops a permanent section to assist and co-ordinate Military Vicariates. At the beginning of this year, the resignation of Bishop Morgan was announced in accordance with Canon 401 par.1. A former Navy Chaplain and Principal Chaplain, Monsignor Geoffrey Francis Mayne was appointed Military Vicar of Australia on 2 January, 1985. His Episcopal ordination took place in St. Christopher’s Cathedral, Canberra on 27 February, 1985. Most Rev.Francis Rush, President of the Conference of Catholic Bishops of Australia was Principal Celebrant. The location of the ceremony in Canberra and the choice of the President of the Bishop’s Conference to be Principal Celebrant confirmed the Military Vicariate as an integral part of the whole Catholic Church in Australia. The publication of the Apostolic Constitution “Spirituali Militum Curae” on 21 July 1986 marked the final step in the development of the Church’s ministry to and concern for the men and women of the Australian Defence Force. As the Military Ordinary of Australia, Bishop Mayne immediately drew up the Statutes of the new Military Ordinariate and submitted them to the Congregation for the Bishops. They were submitted to the Holy Father in June 1987. The final approval was granted on 1 June 1988. They were promulgated and became effective from 1 November 1988. 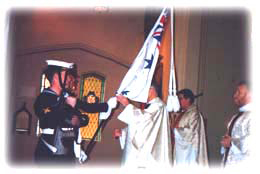 The Military Ordinariate, juridically comparable to a Diocese, is entrusted to the Military Ordinary appointed by the Supreme Pontiff and is a personal and territorial jurisdictional structure erected by the Holy See for the spiritual and pastoral care of those attached to the Defence Force of Australia. The Military Ordinary is a proper ordinary by reason of his office and has the rights and obligations of a Diocesan Bishop. He is subject to the Congregation for Bishops. By right he is a member of the Australian Episcopal Conference (Australian Catholic Bishops’ Conference). Because of his pastoral mission, the Military Ordinary normally will be free of other duties involving care of souls unless particular circumstances require otherwise. All areas, places and establishments proper to the Defence Force and reserved to military personnel fall primarily and principally under the jurisdiction of the Military Ordinary, and secondarily under that of the diocesan bishop, as often as the Military Ordinary or his Chaplains are absent or impeded. In such cases, both the Diocesan Bishop and the local parish priest, act in their own right. These arrangements have worked effectively and practically in Australia. The passing years have seen the development and growth of the Chancery in Canberra where it is now well-established. Bishop Mayne made the decision to incardinate priests into the Ordinariate. Also, after consultation with the Chaplains, four Service Officers were accepted, trained and ordained to the Permanent Diaconate and commissioned as full-time Chaplains – three in the Army and one Air Force. This necessitated a rewriting of part of the Statutes. The revised Statutes were approved on 11 July 1992. The then Army Principal Chaplain, Msgr. Tony Toms, organised a military pilgrimage to Lourdes – the Western Front and Rome 24 May to 11 June 1994. Bishop Mayne, with a group of twenty one Service personnel, participated successfully in this first-ever effort. and has been able to make a positive contribution. On 18th July 2003, in accordance with the requirements of Canon Law in regard to age-retirement and ill health, the Holy Father accepted the resignation of Bishop Mayne and appointed Bishop Max Davis to succeed him as Military Ordinary of Australia. Bishop Davis was consecrated Bishop in St. Christopher’s Cathedral, Canberra on 22 August 2003 and took possession of the See on the same date. There are billets for 30 full-time Chaplains and over 80 Chaplains are involved at present in various aspects of the work of the Catholic Military Ordinariate of Australia. Chaplains are an integral part of the Character Training Programme of the Australian Defence Force and are deeply involved in the spiritual, moral and welfare care of the men and women they are privileged to serve.